Sometimes in engineering we are asked to design a circuit that will transfer the maximum power to a load from a given source. According to the maximum power transfer theorem, a load will receive maximum power from a source when its resistance (RL) is equal to the internal resistance (RI) of the source. If the source circuit is already in the form of a Thevenin or Norton equivalent circuit (a voltage or current source with an internal resistance), then the solution is simple. If the circuit is not in the form of a Thevenin or Norton equivalent circuit, we must first use Thevenin’s or Norton’s theorem to obtain the equivalent circuit. Here’s how to arrange for the maximum power transfer. 1. Find the internal resistance, RI. This is the resistance one finds by looking back into the two load terminals of the source with no load connected. As we have shown in the Thevenin’s Theorem and Norton’s Theorem chapters, the easiest method is to replace voltage sources by short circuits and current sources by open circuits, then find the total resistance between the two load terminals. 2. Find the open circuit voltage (UT) or the short circuit current (IN) of the source between the two load terminals, with no load connected. Using TINA’s Interpreter, it is easy to draw P, P/Pmax, and h as a function of RL. The next graph shows P/Pmax, the power on RL divided by the maximum power, Pmax, as a function of RL (for a circuit with internal resistance RI=50). Now let’s see the efficiency h as a function of RL. The circuit and the TINA Interpreter program to draw the diagrams above are shown below. Note that we we also used the editing tools of TINA’s Diagram window to add some text and the dotted line. Now let’s explore the efficiency (h) for the case of maximum power transfer, where RL = RTh. which when given as a percentage is only 50%. This is acceptable for some applications in electronics and telecommunication, such as amplifiers, radio receivers or transmitters However, 50% efficiency is not acceptable for batteries, power supplies, and certainly not for power plants. Another undesirable consequence of arranging a load to achieve maximum power transfer is the 50% voltage drop on the internal resistance. A 50% drop in source voltage can be a real problem. What is needed, in fact, is a nearly constant load voltage. This calls for systems where the internal resistance of the source is much lower than the load resistance. Imagine a 10 GW power plant operating at or close to maximum power transfer. This would mean that half of the energy generated by the plant would be dissipated in the transmission lines and in the generators (which would probably burn out). It would also result in load voltages that would randomly fluctuate between 100% and 200% of the nominal value as consumer power usage varied. 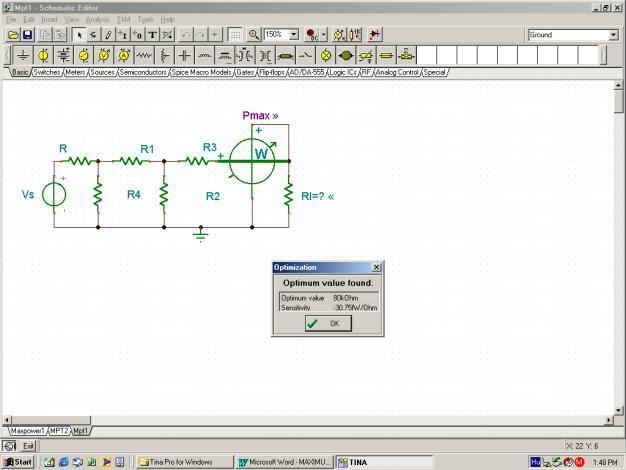 To illustrate the application of the maximum power transfer theorem, let’s find the optimum value of the resistor RL to receive maximum power in the circuit below. Find the maximum power of the resistor RL . The following problem is more complex, so first we must reduce it to a simpler circuit. Find RI to achieve maximum power transfer, and calculate this maximum power. First find the Norton equivalent using TINA. We can also solve this problem using one of TINA’s most interesting features, the Optimization analysis mode. To set up for an Optimization, use the Analysis menu or the icons at the top right of the screen and select Optimization Target. Click on the Power meter to open its dialog box and select Maximum. Next, select Control Object, click on RI, and set the limits within which the optimum value should be searched. To carry out the optimization in TINA v6 and above, simply use the Analysis/Optimization/DC Optimization command from the Analysis menu. In older versions of TINA, you can set this mode from the menu, Analysis/Mode/Optimization, and then execute a DC Analysis. After Optimization, the value of RI is automatically updated to the value found. If we next run an interactive DC analysis by pressing the DC button, the maximum power is displayed as shown in the following figure.